Confused about what to eat before training? Most people are! One of the most frequently asked questions I get is what should I eat pre-workout? And the answer can vary. Before we go any further, let’s quickly explain carbohydrates. Depending on the type of carbohydrate you have, they can release slowly into the blood or quickly into the blood. The Glycaemic Index (GI) is a measure of how quickly sugar is released into the blood and, therefore, how quickly energy is released. Low-GI foods: release energy slowly over a few hours. Examples include lentils, beans, brown rice, high-fibre cereals, oats, wholemeal bread, sweet potato, peas, dried apricots, apples and peaches. 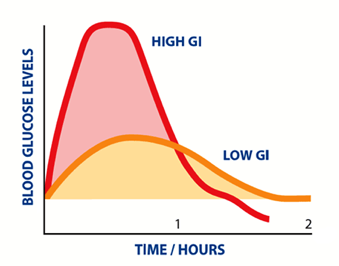 High-GI foods: release energy quickly into the blood, and also lead to a dip in energy sooner than low-GI foods. Examples include white bread, low-fibre breakfast cereals, white potato, energy gels and drinks, some fruits and table sugar. It’s important to understand how the Glycaemic Index works in order to understand how to best fuel your workouts. Porridge made with semi-skimmed milk with banana and honey/nut butter. Prioritise drinking water so that you’re properly hydrated before your session. Try and eat a mini-breakfast 30-60 minutes before. Have nutritious, high carb foods such as wholegrain toast with honey/jam, porridge, cereal with milk, granola bar, rice cakes with nut butter, dried fruit or a banana. If you really struggle with eating early in the morning, try and have a nutritious drink such as milk, a milkshake or protein/carb shake. If you struggle for time, prep your food the night before so you can just grab and go! I’ve given you some ideas of foods and timings you can try before training but, ultimately, everyone is individual. The best way to find out what works well for you is a little bit of trial and error – so use this blog as a guide and try out different combinations to fuel yourself for success in your training!